Some of the best design ideas come from using your imagination and not your wallet. I love these ideas so much that I know I'll be incorporating them into my home this season. 1. Bringing in Elements from Nature. I love the idea of using a TREE LIMB that may have been knocked down on a windy day. 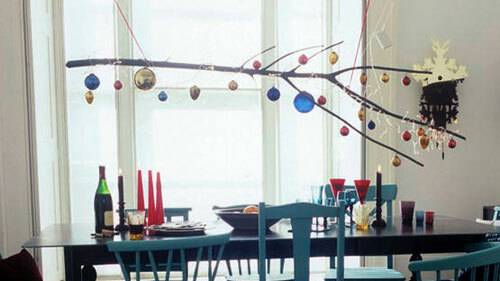 You can create this look by suspending a branch above the dining table with fishing line and thumb tacks. A few ornaments really add finishing touches. This also eliminates the need for a centerpiece since the limb makes a big statement of it's own. Total Cost: $0....gotta love free! Another great place to decorate using the outdoors this year is on your front porch. 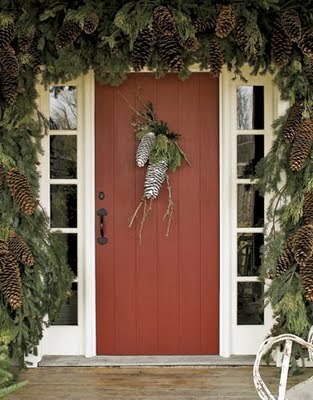 Just by collecting twigs, greenery, and a few pinecones, you can give your front door a Christmas makeover without spending a dime. Make it fun! My son and I go on a "NATURE WALK" pulling along his wagon to collect our finds in. 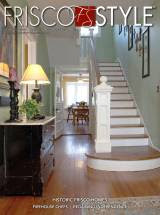 Look around your home at what you already have that could be incorporated into your holiday theme. 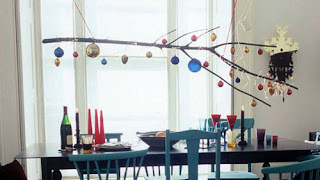 Some of the best design ideas for holiday decorating come from using everyday items. Fill glass apothecary jars with ornaments or pine cones. I always love taking glass hurricanes and filling them with fake snow and adding a chunky pillar candle. You may have your grandmother's favorite books from when she was a child, or your dad's old flexible flyer sled stored up in the attic. Use these sentimental pieces in your holiday decor. I love old sleds, vintage Santa's grouped together and even antique ornaments strung up like garland. Most of all just have fun with it! 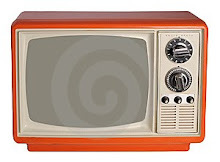 If you mix old and new and repurpose items, it makes your decor interesting and unique to you and your family.